Click for the second of this two-part tribute. CineSchlocker idol Tim Harden twisted his ankle and landed crossways on a cactus the first time he went hunting for Leatherface's crib. Fortunately, his second trip was less accident-prone. Early one Sunday morning, a friend's hand-drawn map led the then 29-year-old telecom tech and his indulgent wife Cheri right to the hallowed homestead. "The house had been moved only days before I got there. It was very disappointing," Tim recalls. "But I took good enough pictures to start a very simple website." Five years later, that simple site's swelled into a clearinghouse of all things Saw, principally detailed chronicles of key shooting locations, and has widely inspired fellow fans to make their own pilgrimages. Yours truly included. 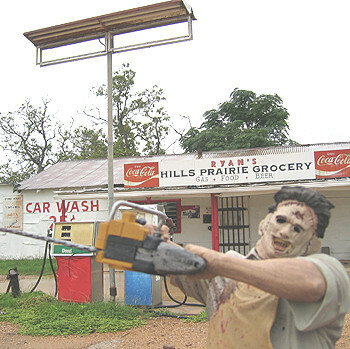 The Texas Chainsaw Road Trip. 9:45 a.m. I'm hovering slightly off the ground right now. This is where it all started! Well, after Night Court's John Larroquette got done doing his Orson Welles impression. I'm talking about when the Hitchhiker's flashbulbs popped again and again in the darkness, revealing portions of what morning radio reports describe as a "grisly work of art" lashed atop a headstone. Remember how the camera slowly creeps back from that gooey closeup? It's hard to believe this quiet spot in Leander is just 183 miles from CineSchlock-O-Rama HQ in Dallas. What've I been waiting on!?! Everything looks so small. No, that's not quite right. Crammed together is more like it. Really gives me a renewed appreciation for the "cinematic" magic of camera lenses. As I understand it, no tombs were needlessly disturbed, as the corpse and its faux perch were placed among existing markers. I giddily snap a few shots trying to line things up as they are in the movie. According to its inscription, the towering monolith over that dead fella's shoulder had already stood 108 years at the time of filming. It's eerily beautiful this morning -- just 30 summers later. Tim Harden: Tomb Raider ... "My wife and I made many treks into Bastrop on a hunt for the barbecue shack and graveyard. After several trips and gallons of gas, we finally found the station. Not far away, we also found a cemetery that looked a lot like the one in the movie. I even asked a few locals if they had heard of the film and if this cemetery was the one.�They all said it was.�So I took quite a few pictures of the inside of the cemetery and posted them on my site. But after going over them for a few weeks, I could not convince myself that I found the right one. Some time passed and I became good friends and business associates with Gunnar Hansen (Leatherface).�I threw the question at him about the cemetery and he went straight to Bob Burns (art director of the film) who replied with the exact location!" Just steps behind me would've been where the Black Maria cattle truck pancaked Ed Neal. Wow! This really is the place! The very setting for Sally Hardesty's climatic rescue by a passing motorist and Gunnar's immortal chainsaw two-step as a deeply despondent Leatherface! The pickup sped down the very hill I just walked up. Hmmm. That looks like the remains of the driveway to my right. As I walk down the path, I can almost see Marilyn Burns breezing right past me with the Hitchhiker whipping that straight razor at her back. In the overgrowth, you can see the fence posts and barbwire from that iconic shot at the end of the movie, though not as panoramic as on film. The railroad-tie swing set, windmill and rusted vehicles of countless cannibalized victims have long since vanished. So too has THE HOUSE(! ), as Tim mentioned earlier, but we'll get back to that in a sec. All that survives is the scraggly tree that once screened its facade and a couple foundation limestones that I'm determined to lug back to my car. There's no way to avoid this sounding corny: It's hard to really adequately verbalize how COOL it feels to be here!!! I feel like I've just stepped out of H.G. Wells' time machine. Only without Wilbur Post pretending to be his own grandson or the Morlocks. The closest thing to those nasties would be the construction crews a couple hundred yards away. 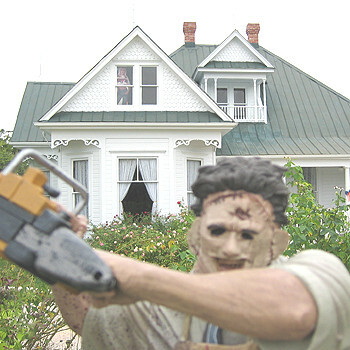 A new Marriott overlooks and a fresh stretch of SH 45 now parallels the property where the "Leatherface House" once stood. In fact, Quick Hill is imminently due for rural renewal as part of La Frontera. An e-business something or another according to the "interactive site plan" on their website. Ah, progress. But, hey, now you can see where the house sat, the driveway and road without hopping the new SH 45 fence line. Wish I'd known that before my hike, though it wouldn't have been quite so dramatic. Oh! Almost forgot. Grandpa Franklin's house sat just south of old 172 until it burned less than 10 years after filming. Tim Harden's first time ... "If you're lucky, you'll see this film before you see the hundreds or thousands of spinoffs that have been made since. The first impact of anything in your life is always the biggest and a masked killer who still lives at the end of the film was definitely something new for me. I was about 16 years old when a friend of mine�somehow got it on VHS. This was back in the days where you paid $80 or so to buy a movie on tape. We locked ourselves in the total darkness of his windowless garage ... I felt as if I'd been dragged through the halls of insanity when I walked away from that film. It changed me forever." 1:30 p.m. If the flick were Gone with the Wind, this would be Tara. If Citizen Kane, it'd be Xanadu. To CineSchlockers, this white Queen Anne cottage is the not-so-sweet home of Leatherface and his killer kin. For 27 agonizing hours, in blazing August temperatures, cast and crew holed up inside shooting cinema's most depraved din-din scene -- without air conditioning! No wonder poor, poor Sally so hastily beat feet through that front plate-glass window! Twenty-five years later, the ailing house was, well, chainsaw'd into seven pieces and hauled from its foundation in Round Rock, roughly 50 miles west to Kingsland where it joined the quaint grounds of The Antlers Hotel. Extensive renovations soothed years of neglect and transformed the former den of horrors into a charming Hill Country eatery known as Four Bears Restaurant. This is too much! I've just ordered a half-pound cheeseburger in Bob Burns' famed "Chicken Room" -- so nicknamed by fans for the road-kill guru's brainstorm to stuff a live hen into a canary cage. My waitress Trish recommends the spicy fries. They're quite tasty. She's a dish herself. Sorta reminds me of Ms. Hardesty minus the tongue piercing. Speaking of, just steps ahead is the aforementioned dining room where Grandpa (the greatest killer that there ever was!) futilely tried to brain Sally like a prize heifer. I've always wondered why the Sawyer clan felt the need to haul out that big washtub for the proceedings. Surely it wasn't for the sake of cleanliness. Probably didn't want to waste any coed squeezings. But I digress. Four Bears co-owner Tom Fox joins me for the inside skinny on the house. "They come from all over the country," he says of his Saw-enthused patrons. "They know so much about the movie and want their pictures taken in certain places. 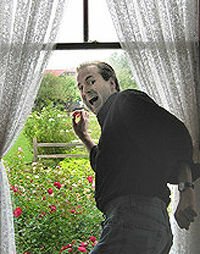 I wish we had a break-out window!" But the most requested photo-op? Mr. Fox doesn't blink: "Back there where that first guy got whacked!" That'd be the former steel doorway at the base of the stairs. (It was built for the film and doesn't look the same today.) Fortunately for diners, lovely lace curtains, hansom hardwoods and Spanish artwork have long since replaced Leatherface's slaughter-house decor. Mr. Fox is really the first to embrace the house's horror legacy. In fact, Four Bears will likely sellout their inaugural Halloween ode to Saw featuring an outdoor showing of the film on a 20-by-40 foot screen, filmmaker Q&A, guided house tours and the requisite costume contest. (Careful with those chainsaws, fellas.) Co-owner and resident culinary maestro Sebastian Weddle has also outlined a special indoor feast for VIP ticket holders of Osso Buco -- roasted pork shank with the bone appropriately prominent. Outdoors? Tasty barbecue and, as featured in Texas Chainsaw Massacre 2, the Sawyer family's award-winning chili. Hate that I'll miss the festivities. Put me down for next year! 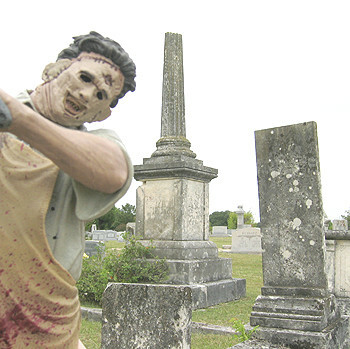 Tim Harden sets 'em straight ... "The Texas Chainsaw Massacre is a HUGE urban legend. Just about everyone knows the title and 90 percent of the e-mail I get is to argue with me that it really did happen. Some people even think that the film is a real documentary that captured actual deaths on film. So another purpose of my website is to debunk these myths." 5:20 p.m. After booting an insane hitchhiker for trying to carve his initials into Franklin's arm without permission, the kiddos stopped at this lonely gas station near Bastrop for a fill up. Unfortunately, the pumps remain dry today, though the building still stands. Just don't huff or puff. It's here Sally and pals were also warned not to "go fooling around other folks property ... [because] some folks don't like it and don't mind showing you." If only they'd listened to their elders! Later that night, the shack's also at the finish line of Sally's screeching six-minute foot race against a certain chainsaw-wielding maniac. The only other foot traffic today is a scrawny kitty cat I've decided to nickname Headcheese. Like all the stops along this strange journey, it's amazing how recognizable the old joint is after all these years. The light pole between the pumps hasn't changed. The tree-trunk porch posts have been painted red. My inner geek feels compelled to keep snapping away even as a light rain falls and the sun sinks lower. Harden said he got rained on his first visit here, as did the crew during filming, so I guess the wet weather is a good omen and fitting finale for this adventure. Tim Harden down under ... "One of the most impressive things I see are people literally traveling from all over the world. I vividly remember a guy from Australia who e-mailed me a few questions and said he'd be flying in to see the locations. Sure enough, he came and had a ball! ... Inevitably, folks invite me to come along as a tour guide. I'm very flattered by that, but think I'm done with my days of jumping fences. My website is the best tour guide around!" Amen to that!!! Thanks, Tim, for making my little adventure in geekdom possible. Your relentless research and infectious enthusiasm has made TexasChainsawMassacre.net an ongoing gift to fellow fans all over the world. Let's hope the third and fourth generations of Saw faithful are just as anxious to hit the road. and companion DVD guide -- The Saw is Family. Have genre reviews zapped to your desktop TWICE a month! Location: 1010 King Street in Kingsland, Texas. Tip: Try chef Sebastian Weddle's Wild Alaska King Salmon ($20) or half-pound Masterpiece Burger with spicy fries ($6.50). Open for lunch and dinner Wednesday through Sunday. Call 325-388-8778. Website. Location: Northeast corner of CR 172 and SH 45 in Round Rock, Texas. From I-35 exit westbound on FM 1325/SH 45. Quick Hill is approximately one mile west of I-35. Tip: Old Country Road 172 begins near Hesters Crossing Road and ends before intersecting SH 45. 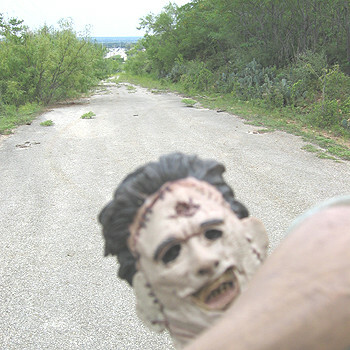 The road, driveway and former site of the Leatherface House are all visible from SH 45 fence line. Location: Northeast corner of FM 2243 and North Bagdad Road in Leander, Texas. Tip: Monument grouping featured in the film is visible from east gate and can be photographed without straying from the interior driveway. Location: 1073 SH 304 in Bastrop, Texas. From westbound SH 71 exit southbound SH 304. Station is five miles south on east side of 304. Tip: Don't wander into nearby farmhouses.